Since 1999 when Nigeria returned to democratic rule, elections at all levels, have been marred with electoral irregularities – violence and ballot box snatching. Now, the trend is fast moving to vote buying – a process of inducing eligible voters to exchange their votes for cash or other material benefits in favour of a political party or candidate contesting an election. In this Special Report, Investigative Journalist Patrick Egwu probes cases of vote buying during the recently held governorship election in Osun state where votes were sold for N2,000 and examines the implications for 2019. 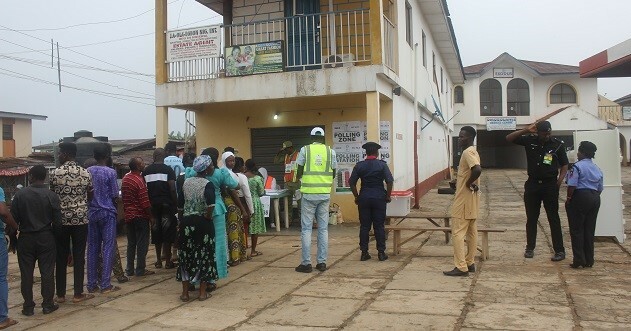 Disguising as a voter with his Permanent Voters Card (PVC), this reporter makes his way to a polling unit located in a community primary school in Osogbo, the state capital where voters had gathered in large numbers for accreditation before casting their votes. It was drizzling and the weather didn’t stop voters from coming out to exercise their voting rights. By the far-end of the school, a group of mostly young people, had gathered – murmuring and having a conversation in a low tone. Nurudeen Bolaji, was at the middle, counting some Naira notes and giving to each person in the group. A list of voters who presented their PVCs had been prepared a day to the elections. When somebody’s name is called out, Bolaji hands over N2,000 to the person who then gently walks away. “I have collected my own share of the money,” Joseph Tunde, who was part of those who collected money from Bolaji said. “It will buy me food and drinks this night,” he quipped. “I didn’t receive any money from anybody but if I had seen someone who offered me money, I would have accepted,” another voter at the polling unit who declined to give out his name said. “But as an individual, I know what is on my mind and that’s what I will do while voting. I might collect the money, but will not vote for their candidate,” he said. 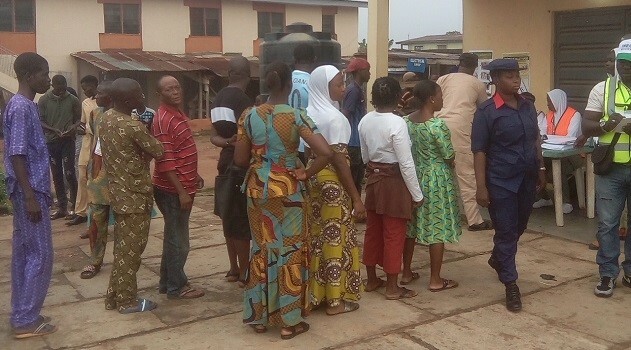 At another polling unit in Ede North LGA, this reporter also observed a group of people sharing wads of N500 notes –unarguably, proceeds from selling their votes to a candidate or political party. Three policemen were standing close to the polling unit but it didn’t prevent the voters from doing what they were doing. When this reporter, with an accreditation vest and camera hung on his neck, approached the group of young voters where they were sharing the money, some of them became hostile and sensing danger, dispersed immediately in different directions. “Don’t take my picture,” one of them said furiously, while taking quick steps to move away from the location. “Why are you trying to take our pictures?” another young man among the group added. When this reporter decided to ask them if they had voted and how the election process was going, some of them started laughing, showing indifference to the election. “Yes, we have voted,” they echoed together while smirking and walking away from the location. While Bolaji and his group of vote sellers and buyers were lucky to escape arrest, the story was different for others. Few hours later, two voters were arrested at Ede LGA in the state for possessing two PVCs which do not bear their names nor pictures. 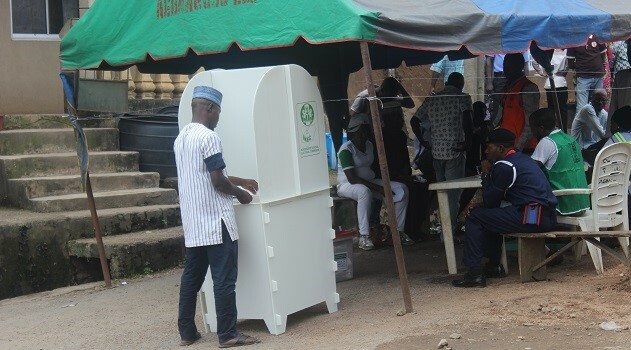 The two men were arrested by security officials at the polling unit in the area when they had come to cast their votes. Similarly, at another area in the state, three party agents were arrested with wads of cash with which they allegedly intended to induce voters with. The group of young voters in Ede LGA who were seen sharing wads of N500 notes. (Credit: Patrick Egwu). At every election – local, state or national, voters exchange their votes for monetary benefits or food items from candidates contesting election. This practice is common among political parties and their candidates or party agents – casting doubts on future election outcomes and resolve to end the practice. In most cases, prior to the elections, voters are approached and induced with money in other to influence their choice of voting. In the rural areas with a majority of the population illiterate, and predominantly farmers, party agents, before elections, visit them at a place where they are largely concentrated – markets, town halls and churches to share food items and stipends while educating them on a candidate to vote for and what they stand to gain if elected. “This is quite common both in urban and rural communities,” said Johnson Madu, director, Centre for Good Governance. “This negativity affects election outcomes because the people vote based on the money they receive and not based on conviction. It would make it impossible for young persons who do not have the financial clout to participate and win an election,” he said. In July, during the governorship election in Ekiti state, voters were offered money, gifts and material rewards by politicians and party agents few hours to voting to influence the candidate they vote for. Prior to the elections, pensioners and government employees in the state received credit transactions of N4000 and N3000 in their bank accounts respectively – a form of inducement to influence their voting decisions on the election day. After the reported cases of vote buying during the Ekiti elections, subsequent cases followed – in Kogi and Katsina states where cases of vote buying were widely reported. In Kogi state where a bye-election was conducted into the federal house of parliament, voters who had voted for a designated candidate, received N2000 each from party agents at the polling units. Similar incident happened in Katsina state where the opposition party accused the ruling party of vote buying which was done to help their preferred candidate. With just five months to next year’s elections, analysts and experts believe the widespread cases of vote buying will influence the outcome of the process and the candidate who emerges winner across different elective positions. “If you look at the budget of some of these political parties, you will see that they are ready to buy anything in 2019, not just votes. 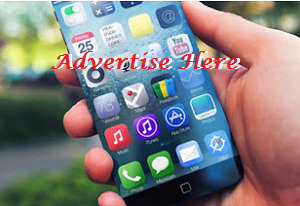 It will determine who wins or who may not win in the 2019 election.,” Onuoha said. Most importantly, the practice of vote buying might have effect on young people seeking to run for public office for the first time since a recent law was passed. In May, president Muhammadu Buhari signed into law the Not Too Young To Run Bill which removes the age restrictions preventing young people from contesting public offices. The practice of vote buying which is currently, unfortunately, a decisive factor on who gets elected, might however, limit their chances as they might not have the financial capabilities to entice or buy votes even if they want to. However, despite the selling of votes during the elections, some of the voters who spoke to Ripples Nigeria said they cannot sell their votes despite the offer. “No amount of money will be given to me that I will collect because I am here to perform my civic responsibility as a citizen,” said Christopher Ade, 60, a pensioner. “And since we started this process this morning, things have been moving fine because I have not spotted any malpractice”. 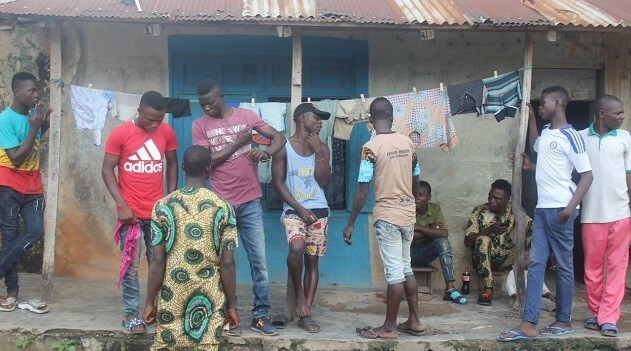 Demola Ajire, a 20-year-old student who is voting for the first time told Ripples Nigeria, “I don’t see any reason I should sell my vote for whatever amount the person is offering because selling it means I’m selling four years of good governance due to temporal benefits. The Independent Electoral Commission (INEC) has been accused of not doing enough to tackle the widespread practice of vote buying during elections at all levels. The INEC boss, Mahmoud Yakubu confirmed that vote buying occurs during elections but said that those who resorted to the practice were those who could not subvert the administrative process of the Commission. But the level of implementation of the Act since it was signed becomes debatable. “We are taking it very serious because it was not obvious until the last election when it became so widespread,” an official of INEC who begged not to be mentioned because she was not authorized to speak on the matter said. Recently at a stakeholders meeting in Enugu state, the Resident Electoral Commissioner, Emeka Ononamadu restated the Commission’s readiness to end all forms of electoral malpractices like vote buying, ballot box snatching while ensuring free and credible elections. “We are committed as a matter of patriotism to better the electoral process in next year’s election because we have braced up for greater dedication and more work,” he said. Despite INEC declaring the first batch of election in the state inconclusive and a run-off fixed for Thursday September 27, if not checked properly with adequate measures, the already reported cases of vote buying might still play out among voters and party agents, and ultimately determine who wins the election. As an evolving phenomenon, vote buying is capable of undermining the people’s choice and the nation’s democracy, because it is akin to rigging. The authorities need evidence to nib it in the bud. This report was supported by Action Aid Nigeria with funding from European Commission, within the Mobilizing Civil Society Support for the Implementation of African Governance Architecture (AGA) project.